The BMC is home at last! 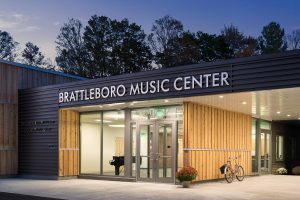 During the fall of 2017 the BMC threw open its doors and proudly welcomed the first wave of students and faculty to its stunning new Music Center on Blanche Moyse Way. The award-winning facility with its light-filled spaces, accessibility for all, convenient parking and, most especially, its excellent acoustics received raves from music lovers of all stripes. Even now, after 18 months on the new campus, first-time visitors to the BMC express awe and admiration at what this small, rural Vermont community has created. Their enthusiasm for the new BMC reminds us how fortunate we are to have this new home where music is celebrated every day. 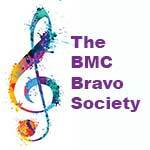 The new BMC exists today because of the generosity from dedicated friends, foundations and several bequests. Their commitments are a testament to the strength of our music community, and we are enormously grateful. In early 2019 it was announced that the Make a Place for Music Capital Campaign had exceeded its $5.5 million goal. To date, the campaign has raised $5,548,211 to build and furnish its new home for music – ahead of schedule, on budget and without debt! The campaign’s success also created two important endowments that will help ensure that our campus and collection of instruments are cared for in perpetuity. It’s important to remind everyone that before the BMC launched its campaign to build a new home, $1.3 million was contributed by 84 families to establish our first-ever endowments. They are now providing a steady source of annual income for scholarship support and expanded programs. We thank all those early endowment donors for their generosity and faith in the BMC. Best of all, the enthusiasm that made this campaign possible is ushering in a new era at the BMC. With new program offerings, new faculty, outreach to area schools, and more community collaborations and world-class concerts, the BMC is taking its place as one of the cultural jewels of New England. Bravo – Together We Built It! In 2016 the BMC purchased the 2.2 acre property across from Living Memorial Park in Brattleboro. 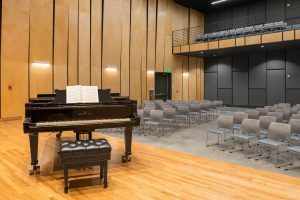 During 2016-17, the existing facility was transformed into the Harriet and Roland Fisher Music Education Building (10,500 sf) and the new performance-quality Auditorium (4,400 sf) was constructed. Both projects were completed in less than ten months. The task of equipping and furnishing both spaces to create a welcoming, fully functional home for music began in 2017 and will continue through 2019. Two additional endowments were set up in early 2019 to help ensure that both our campus and instrument collection are well cared for in perpetuity. Ultimately, a successful campaign comes down to the team of people who worked behind the scenes. Our chair Doug Cox and his team of volunteers are the true heroes of this campaign. Doug worked tirelessly for over a decade, shepherding the project from vision to completion – despite several challenging twists and turns along the way. Through it all, he proved to be an exceptional leader with an expansive vision and abiding faith in the project and the people of this community. Doug Cox, Chair; Christie Baskett, Tom Cain, Brian Cohen, Mary Greene, Jonathan Jesup, Carol Ann Johnson, Ellen Martyn, Margery McCrum, Jim Maxwell, Dave Snyder, Marty Spencer, Diane Tayeby, Janet Wallstein and Janice Warren. While there is immense pride for what has been accomplished, the work of securing the BMC is never done. The reality is that the BMC is a small arts organization in a rural New England community that is not wealthy. Our task now – and one we take very seriously – is to focus on the future and ensure that the people and programs that make music across the new campus continue to thrive. Support the Annual Fund Every Year. 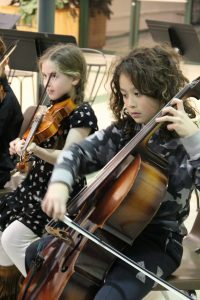 Our programs, concert series, music in the schools outreach and scholarships all depend on a successful Annual Fund. Your consistent support each and every year allows us to not only maintain our current programs but to plan for a vibrant future and expand our offerings. In short, your gifts help us to be the best BMC possible. Add to Our Endowment. While the BMC’s endowment funds are now established, each would benefit from the infusion of additional gifts to have a greater impact. Gifts may be made in honor or memory of someone special. And, you may direct your support to the fund that is most meaningful to you. Make a Place for the BMC in Your Will. Your legacy can be as simple as adding a bequest to your will, and it’s well worth the little time it takes to make this happen, no matter the size of your estate. If you’ve already remembered the BMC in your plans, we are very grateful. Please let us know so we can thank you and welcome you into our Legacy Society. Ensuring the financial well-being of the BMC is a lifetime commitment. Thank you for joining us on this extraordinary journey.